“Today, it is with enthusiasm and excitement that we announce the intent of our partner universities to establish scholarships, summer internships, graduate program fellowships, and research assistantships in the areas of science and technology for Hawaii’s students. “In a speech on May 26, Governor Ige emphasized that science and technology are critical to Hawaii’s economy and education system, adding that ‘young people need to reach for the stars, literally and figuratively.’ He asked the Thirty Meter Telescope team to significantly increase its support of Native Hawaiian students interested in science and technology, through admission to and scholarships at its partner institutions, with priority given to Hawaii Island students and then to students statewide. “TMT and our partners support the Governor’s vision. In the past two weeks, Caltech and the University of Chinese Academy of Sciences have pledged their support, and we will work within each university’s curriculum and requirements to establish educational programs that fulfill the Governor’s vision. More of our partner universities are considering establishing similar programs to host Native Hawaiian students from Hawaii Island and elsewhere in the state. "In addition, the Department of Astronomy at the University of Tokyo and the Department of Astronomical Science at the Graduate University for Advanced Studies (SOKENDAI), affiliated with the National Astronomical Observatory of Japan (NAOJ), are strongly encouraging applications from Hawaii for graduate studies. NAOJ's Subaru Telescope has been offering job and internship opportunities to UH students in its various activities and has agreed to collaborate with UH Hilo on its graduate program in astronomy. Additional frameworks will be explored to strengthen these ties in conjunction with TMT as well." The Thirty Meter Telescope Project has been developed as a collaboration among Caltech, UC, the Association of Canadian Universities for Research in Astronomy (ACURA), and the national institutes of Japan, China, and India with the goal to design, develop, construct, and operate a thirty-meter class telescope and observatory on Mauna Kea in cooperation with the University of Hawaii (TMT Project). 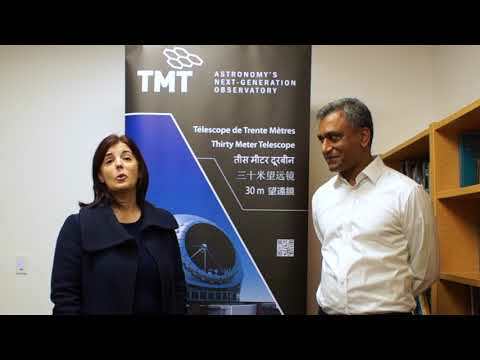 The TMT International Observatory LLC (TIO), a non-profit organization, was established in May 2014 to carry out the construction and operation phases of the TMT Project. The Members of TIO are Caltech, UC, the National Institutes of Natural Sciences of Japan, the National Astronomical Observatories of the Chinese Academy of Sciences, the Department of Science and Technology of India, and the National Research Council (Canada); the Association of Universities for Research in Astronomy (AURA) is a TIO Associate. Major funding has been provided by the Gordon & Betty Moore Foundation. For more information, visit tmt.org, www.facebook.com/TMTHawaii or follow @TMTHawaii.